Synopsis : Information regarding special olympics games and sports for persons with a disability. 1: Special Olympics are the largest sports organization for people with intellectual disability. 2: There are more than 72 Programs in Special Olympics North America. 3: Special Olympics is a global nonprofit organization serving the nearly 200M people. 4: The first International Special Olympics Games were held in Chicago in 1968. The Special Olympics are the world's largest sports organization for children and adults with intellectual disabilities, providing year-round training and competitions to more than 4.4 million athletes in 170 countries. Special Olympics competitions are held every day, all around the world including local, national and regional competitions, adding up to more than 70,000 events a year. Special Olympics is a global nonprofit organization serving the nearly 200 million people with intellectual disabilities. Among their other activities, Special Olympics conducts the Special Olympics World Games every two years, alternating between Summer and Winter Games. The Special Olympics, founded by Eunice Kennedy Shriver in 1968, is composed of passionate, committed individuals from every walk of life, who recognize the value and unique gifts of people with intellectual disabilities, who together, share the common belief of dignity, equality and opportunity for all people. More than 2.5 million athletes of all ages are involved in Special Olympics sports training and competition in more than 180 countries. The Special Olympics often is the only place where children and adults with intellectual disabilities have an opportunity to participate in their communities and develop belief in themselves. The organization offers year-round training and competition in 30 Olympic-type summer and winter sports. There are more than 72 Programs in Special Olympics North America. Special Olympics North America has 544,581 athletes participating in all 30 sports offered by Special Olympics. The first International Special Olympics Games were held in Chicago in 1968. Anne McGlone Burke, a physical education teacher with the Chicago Park District, began with the idea for a one-time Olympic-style athletic competition for people with special needs. Burke then approached Eunice Kennedy Shriver, head of the Joseph P. Kennedy Jr. Foundation, to fund the event. Shriver encouraged Burke to expand on the idea and the JPK Foundation provided a grant of $25,000. More than 1,000 athletes from across the United States and Canada participated. The first International Special Olympics Winter Games were held in February 1977 in Steamboat Springs, Colorado, USA. In 1988, the Special Olympics was recognized by the International Olympic Committee (IOC). Gold, Silver and Bronze medals for the Summer 2018 N.H. Special Olympics rest on a display tray - (N.H. Air National Guard photo by Staff Sgt. Kayla White). 2009 Special Olympics World Winter Games were held on February 6th 2009 in Boise, Idaho, USA. 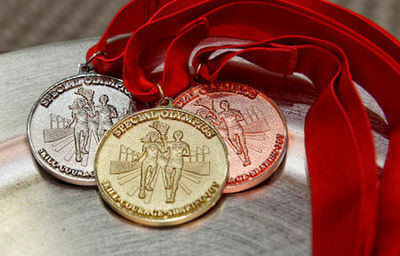 2011 Special Olympics 2011 World Summer Games were held in Athens, Greece, on June 25th- July 4th, 2011. 2019 Special Olympics World Summer Games - To be held in Abu Dhabi, United Arab Emirates. 2021 Special Olympics World Winter Games - To be held in Åre and Östersund, Jämtland County, Sweden. 2023 Special Olympics World Summer Games - To be held in Berlin, Germany. 2025 Special Olympics World Winter Games - To be held in Calgary, Canada. Special Olympics Great Britain (SOGB) is the major provider of sporting opportunities for people with a learning disability and provides equality of opportunity for all athletes regardless of ability or degree of disability. International Board members include President of Iceland Olafur Grimmson; Olympic Romanian gymnast Nadia Comaneci; pop singer and actress Vanessa Williams; Coca Cola CEO Muhtar Kent; and First Lady of Panama Vivian Fernandez de Torrijos. Packabocce Portable Inflatable Bocce Courts for Special Olympics Florida - Inflatable Packabocce courts feature a lightweight but highly durable design that makes them far more portable than traditional bocce courts made out of wood or stone. Above and Beyond From Two Special Olympics Athlete Couples - Inclusive Sports and Unified Teams can promote the human rights of individuals with intellectual and developmental disabilities. 2015 Special Olympics World Summer Games U.S. Team Named - Special Olympics Team USA announces 491 member delegation to represent US at 2015 Special Olympics World Summer Games, July 25 to Aug 2, 2015, Los Angeles, California. Special Olympics Narrows Health Gap Faced by People with Intellectual Disabilities - Special Olympics outlines results of successful two-year old Healthy Communities initiative and announces it will expand the program from 14 to 100 sites by 2025. An Encounter with Carlsbad 2 Special Olympians - Trip to New Mexico to attend wedding results in chance meeting of Special Olympians. Citation: Disabled World. (2019/04/11). Special Olympics Infomation - Games - Rules - Events. Retrieved 2019-04-21, from https://www.disabled-world.com/sports/special-olympics/ Direct Link: Special Olympics Infomation - Games - Rules - Events - Information regarding special olympics games and sports for persons with a disability.